Fleming Garden Committee and Friends: Thank You! Jonathan Kendall, History teacher and founding member of the Fleming Garden Committee, spoke on Tuesday about the Garden and its evolution. Once the kitchen garden of Thorpe Place, the Fleming Garden abounds with signs of its long history: the avenue of ancient, knob-branched apple trees, pruned back for decades to picking height; the massive iron pipes that once heated a terracotta-tiled Victorian glasshouse; the warm red brick walls, riddled with nail-holes from centuries of espaliering fruit trees and training berry vines. 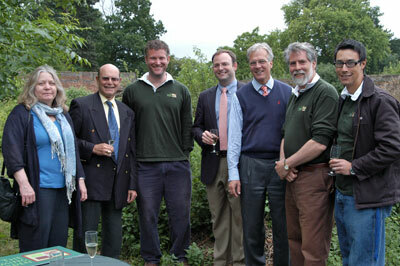 A dozen generations of gardeners have invested their working lives into this fertile plot of land. As we are committed to honouring the heritage of this unique place, we look forward to making the future of the Fleming Garden one of beauty and abundance. With that in mind, we see it as our mission to care for and improve the Garden, and to develop its educational role, so that it may increasingly become a place where young people can gain both horticultural skill and a love of nature, and where people of all ages from the TASIS community and Thorpe Village may enjoy the pleasures of gardening. Two and a half years ago, the land within these walls was overgrown, and students never stepped foot inside. As you can see, we now have a third of the area under cultivation, with over two-dozen kinds of fruits and vegetables. Thanks to the generosity of the TASIS Annual Fund and Fernando Gonzales, we have also begun a program of restoring the damaged greenhouse to its former use, and plan to begin replacing the three gates. Outside the east gate, through which we entered, we will be affixing this new sign with our logo. Most importantly, we have had an increasing number of students here for service and learning-- over sixty upper-school students, many of whom have earned over fifty hours of service here. This spring, virtually the entire student body of the lower school helped us with our plantings. With our youngest gardeners in mind, we have set aside one allotment here to be a picket-fenced Beatrix Potter garden. As you might remember, we had originally billed this gathering as a dedication party. Since then, Michael McBrien has very kindly offered to put the formal dedication of the Fleming Garden at the center of the upcoming Founder's Day on the 9th of September. 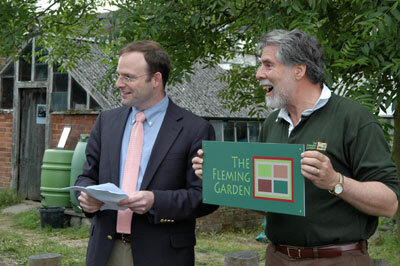 So today we celebrate, rather, the dedication of the many people who have given in so many ways to the Fleming Garden. It is the hard work of Thorpe neighbors, TASIS educators, and dozens of students that is making the Garden a place of beauty and learning. A year ago, we began giving green rugby shirts with our logo to students who work in the Garden twenty hours or more. We have also honored a few adults with rugby shirts. Today we would like to recognize three new recipients. First and foremost, our headmaster, Michael McBrien, who has robustly supported the Fleming Garden, and in particular our vision of offering a rich array of educational opportunities in the garden. Second, our head of maintenance and grounds, Russell Jarman, who, despite his endless tasks and responsibilities, always finds time to give us assistance when we need help. And last, but certainly not least: John Wiltshire, who, as the gardener for decades here, even before the founding of TASIS, has probably spent more time within these walls than any other human being alive. 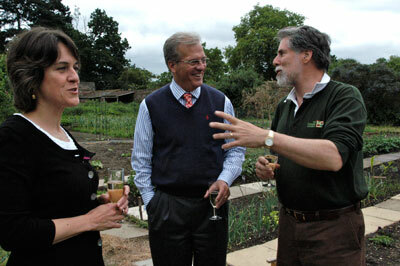 And now, will you please join me in raising a glass… to the Fleming Garden! Mr. Kendall and Dr. Lander presenting the new sign for the Fleming Garden.